Acornkids is the home of colourful, hands on bath-fun products, as well as Kids Bee Happy sand art parties, workshops and activity sets for children of all ages. 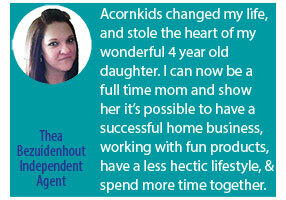 Findout how you can start running your own ACORNKIDS BUSINESS and bring in extra income today. 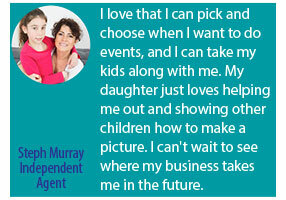 Sign-up as an independent ACORNKIDS AGENT now, and in a few minutes you'll be on your way. Acornkids Bath-Fun, and Kids Bee Happy Sand Art. A unique and exciting range of bath products, books, puzzles and crafts that transforms bathtime, playtime, anytime into fun. An extravaganza of colours, textures and fragrances create magical times, teaching young children through colour, tactile, sensory & creative play. Premium Sand Art. Fun activity for boys and girls. 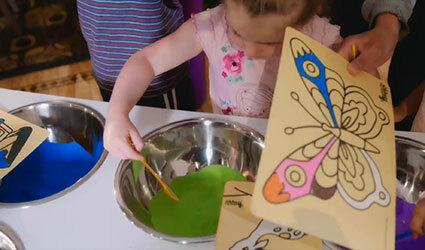 Children create amazing pictures using coloured sand in a fun and flawless way. Hands on, bright colourful fun, for children of all ages. Products, Parties, Workshops and Events. The original, and the best. discover the joy of sand art. Why join the Acornkids family? 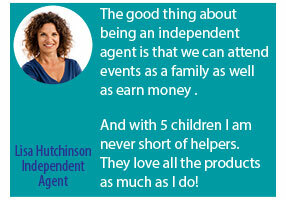 What people say about us . . . .
You don’t need sales experience to join Acornkids. In fact you don’t even have to like sales! But you will enjoy the buzz of demonstrating Acornkids products, as well as running events, working with groups of kids and their parents as they discover the joy of KidsBee Happy sand art. We welcome everybody; whether you are returning to work whilst raising a family or have retired and are looking for a new challenge. Acornkids is a great way to grow your own business but with all of the benefits of a known brand behind you. 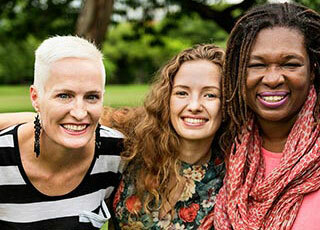 If you do have experience in direct selling, we can offer you an attractive new opportunity. Acornkids is nationally recognised, and Kids Bee Happy is internationally recognised. This gives you the opportunity to get out into your community sell products and and run creative events that people love, with quality products you’ll be proud to represent. Direct Sales company for you…. Order products, and if you want to team build it’s here that you’ll be able to manage your team and keep track of what’s going on. All shipments are done by courier, with 3 day delivery to main centres. Orders are promptly delivered to you. The Acornkids and Kids Bee Happy teams are one of the best aspects of the company. Lots of help, mentoring, support and advice 24/7. Our flexible work from home direct sales business means that you really can work the hours and locations that suit you. Acornkids is a family owned business and when you join us you become part of a family that cares. We are proud of the reputaton we have for going the extra mile.